My friend Kristen and I decided that we wanted to try roller derby some time ago. Like, um, maybe a couple years ago? But like all Big Dreams (er, drunken conversations), we never did anything about it. We decided to at least SEE if we even COULD skate. 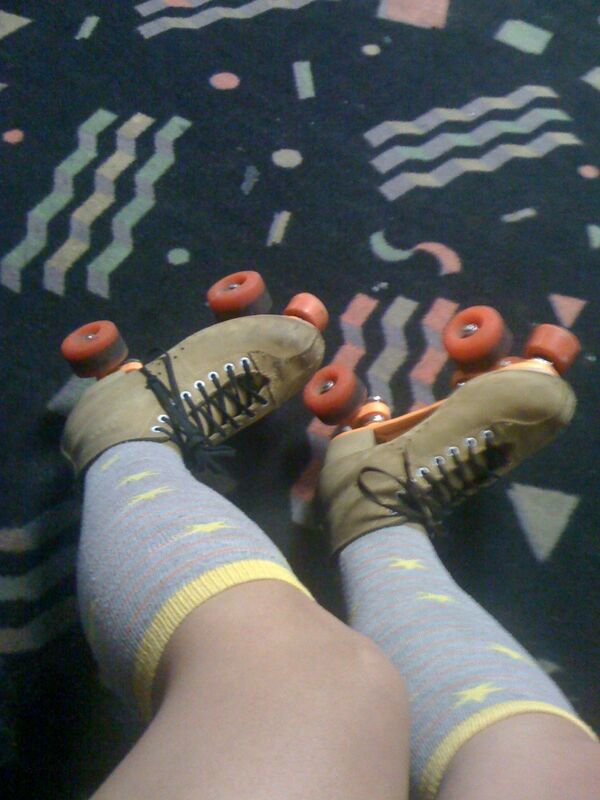 When is the last time you've been on roller skates? 12? 13? We headed to the rink tonight for "cheap-skate" night (hahahahaha). (Additionally, check out the local skate rink website to make your EYES BLEED.) Before we could even step foot (skate?! ha.) on the rink (is it called a rink? circle? parquet flooring?) some small tall punk child (skating backwards and superfast ON THE SIDELINES collided into me and we crashed and both fell and he stomped on my bare foot with his ENORMOUS 13 year old boy feet/skates.) I'm not going to lie; it hurt. And I thought that my skating adventure might be over before it even started. SAD FACE. I would never get to live out my dream of earning a name like Tyra Spanks and/or Honey Bee-yotch. 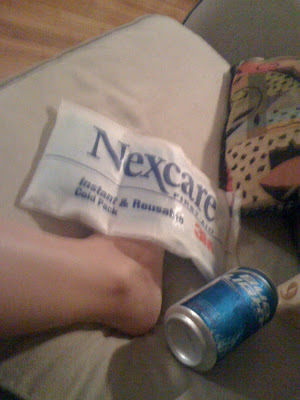 Thankfully, Kristen is a nurse so she inspected my foot and deemed it suitable for skating (read: not broken). And, um, well, we need practice. And, um, I think I'm going to be REAL SORE TOMORROW. Immediately after taking my skates off (relieving pressure), my foot started throbbing so I hobbled home to ice it up and take the edge off with some beer and think about my derby name. d. um, your idea in the comment section? What about YOU? What's your derby name? Labels: now i need some tats, yes? My fave Derby names are ones that are puns. I'm a literature dork, so my Derby name? Pain Austen. Oh yeah. The last time I went roller skating was with my 11 year old niece. She kept falling down and saying she was ready to go, and I kept saying "just let me go around one more time!" Oh how I used to love roller skating. It is sooo much harder as a full size person though! And you know you could get hurt playing roller derby, right? THIS COMMENT IS ENTIRELY TOO LONG. i'm LOVING that you're going to try this! my friend jenn is in a derby league and she's so into it. i'd try it, except we all know i'm kind of a baby. okay, mostly a baby. regardless, i'd still like people to start addressing me as "meg insaney."